We all love a story with a happy ending and that’s exactly how the free spirited life of Mango the Border collie has turned out like. Mango was abandoned, homeless and on the run for months around the Fraser Coast area before he was eventually captured for a well needed vet check and to discover a whole new lease on life. 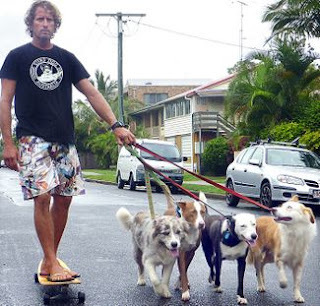 Fraser Coast locals had fallen in love with the wild traveler and would often leave out food for him to eat. Mango made it impossible to be captured and managed to outsmart everyone. He was eventually tranquilised by eating some laced meat that had been left for him. 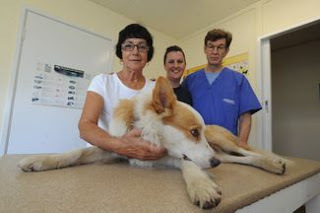 The capture was in the best interest of Mango, who was taken to the local vet and was discovered to be carrying a number of dangerous ticks that were to be immediately removed. After the vet clinic brought Mango back to his full health, the question then remained - where to now for a homeless dog that was used to living the life of a gypsy? Although plenty of locals were putting their hand up, it was clear that mango was suffering from fear and was in serious need of some professional help, to ensure he would be able to recover and lead a normal life, not feeling scared and wanting to be on the run all the time. Natural Balance dog trainer Chris De Aboitiz was called to the job in the hope of rehabilitating Mango and allowing him to regain trust in humans once again. Chris said he would encourage the dog's natural instincts, including being active and that his three dogs would help rehabilitate Mango. He also believed that as part of a pack, or family, the stray would feel more at ease. Turns out Chris knew what he was talking about; today Mango is enjoying a much less fearful life and is well on the road to recovery. Chris has adopted Mango full time and will continue to work with the Border collie, showing him a gentle human touch and helping him to remove any feelings of fear and nervousness that he was once consumed by. Fraser Coast locals were delighted to see Mango when Chris brought him back for a visit to be reunited once again with the town whose hearts he stole. See more of Mango on YouTube. Wonderful work Chris, Mango is one fortunate dog with a future now ahead of him, with a 'few' friends i see. Wishing you and Mango continued good luck and happy times. I was so moved by this story and video of Mango. 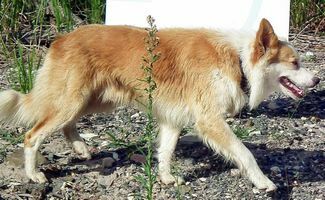 I too have a red border collie that came from a not so pleasant background so I know the hard work and dedication that goes into transforming these wonderful but spiritually lost canines. Nearly 4 years down the track and my girl is a very different dog reaching knew milestones everyday and constantly surprising us with new found courage. Can't wait to see the updates. Great Job Chris and keep smiling Mango.